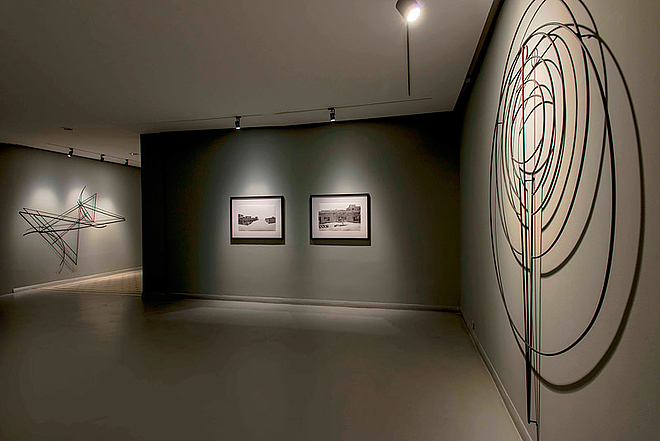 An Astronomical Determination of the Distance Between Two Cities is Heba Y. Amin's second solo exhibition at Zilberman Gallery-lstanbul, on view in the main space in Misir Apartmani, from 7 January - 8 February 2017. In a two-part project, Amin looks at the historical paradigms of technology and urban development in relation to contemporary migratory paths. By employing cartographic research and landscape surveillance, Amin critiques the predatory view of landscape and the exoticization of women's bodies in relation to geography. The project proposes a visual allegory focusing on architectural fragments and sexual desires to challenge colonial histories. Her first project entitled The Earth is an Imperfect Ellipsoid utilized Al-Bakri's "Book of Roads and Kingdoms," an eleventh-century geography text describing trade routes in West Africa, to critique the authored accounts of travelers describing cities through sexually explicit descriptions of the women they encounter. Since the original manuscript exists only in fragments, Amin embarked on a five-month journey along the same routes, documenting geographies missing from the text. 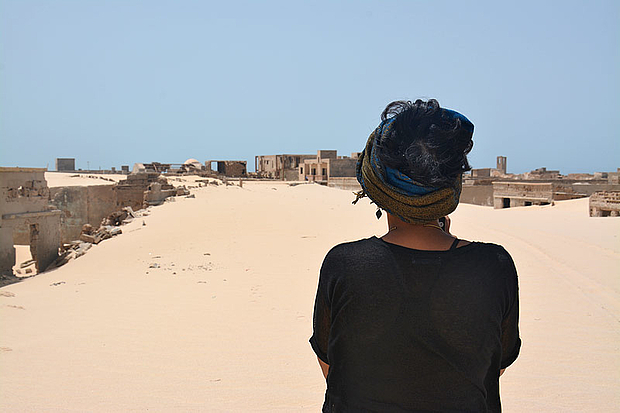 Among the cities visited is La Agüera, a former Spanish colonial outpost buried in the sand dunes of the Ras Nouadhibou peninsula. 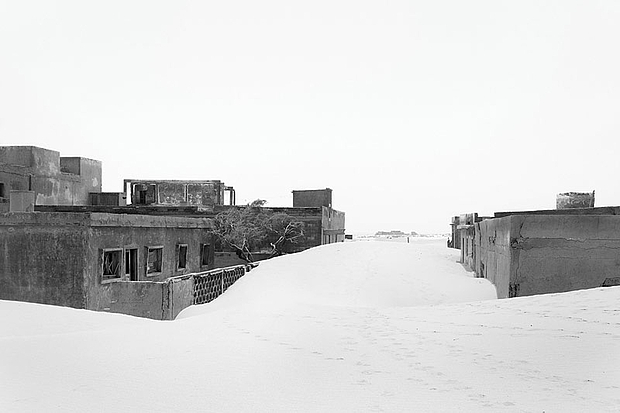 An Astronomical Determination of the Distance Between Two Cities examines the structural remnants of this Saharan ghost town through the found memoir of Jesús Flores, the last living inhabitant from 1933. The work explores the town's colonial era in juxtaposition to the remaining architectural fragments guarded by Mauritanian military forces. Amin confronts the clash between one man's nostalgia for his childhood in Spanish Sahara and the lengthy and brutal struggle for a land whose sovereignty is still disputed after Spanish withdrawal in 1975. Heba Y. Amin is an Egyptian visual artist, researcher and lecturer. She is currently teaching at Bard College Berlin, is a BGSMSC doctorate fellow at Freie Universitat, and a recent resident artist at the Bethanien artist residency program in Berlin. Amin has received many grants, including the DAAD grant and the Rhizome Commissions grant. She is the cofounder of the Black Athena Collective, the curator of visual art for the MIZNA journal (US), and curator for the biennial residency program DEFAULT with Ramdom Association (IT). Furthermore, Amin is also one of the artists behind the subversive graffiti action on the set of the television series "Homeland” which received worldwide media attention. She lives in Berlin and Cairo.